Four days, four new series; I think you can see the pattern here. No, we're not going to start a new series every day from now on! We're just getting into a nice little groove for ourselves.Up until now, though, our posts have been aimed at writers and publishers. Which is cool: writers and publishers certainly deserve a good amount of content for all of the hard work they put into their professions and crafts. But it's the readers who really drive the boat and keep those people in business. Without readers to read whatever we clomp into our keyboards, what's the point? So every Thursday, we're going to run a column dedicated to you, the readers, who make Hunt to Read possible. 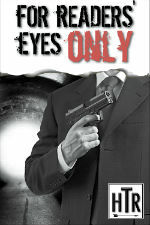 It's called "For Readers' Eyes Only," and should touch on favorite books, new releases, deals, trends, and other timely topics to help readers out. This week, I wanted to touch on a topic that is near and dear to many readers' hearts; namely that first book that you really loved, that shook you to your core and left you shaking your head in awe and wonder. My tale begins as a second grader. An older kid at my grade school had made it his goal to read every Newbery Award-winning book by the time he graduated in 6th grade (we were preschool through sixth back then--no middle school). Not only did he accomplish this feat a year or two early, but it inspired my parents to "guide" me into trying to accomplish the same. Since I was in second grade at the time, they figured I had plenty of time to get through all seventy of them. Though I ultimately fell short of the mark, I gave it an honest effort. Though I enjoyed books like The Voyages of Doctor Doolittle, forced my way through Johnny Tremain, snoozed through Island of the Blue Dolphins, raised an eyebrow through The Westing Game, cried through Shiloh, and thoroughly appreciated the mind-bending ability of Madeline L'Engle to send my brain alight in A Wrinkle In Time, none of them really struck that chord that I would later find signaled a true love of reading. 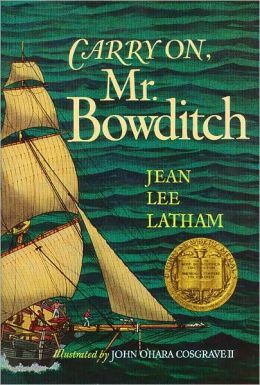 Then one day in third grade, perhaps after an excursion to the bookstore during weekend errands with my dad, I found myself clutching a copy of Carry On, Mr. Bowditch, by Jean Lee Latham. I finished the book in a single sitting, at my parents' old house, on their rather uncomfortable orange plaid polyester blend couch in the living room. I loved the rags-to-riches story of a dirt-poor boy sold into indentured servitude who, nonetheless, taught himself Latin and French not for any particular reason other than the pure pursuit of knowledge, of wanting to read Newton's Principia and the like. Nathaniel Bowditch was everything I wanted to be: super-smart, very capable, ship's first mate in his early twenties, captain soon thereafter. All the while, he used his well-grounded intellect to travel the world, having adventures and captivating my young mind. I loved the book so much that years later, when my sixth grade teacher was looking for books for the class to read, I suggested COMB, iced breaking out the "I mean, it is a Newbery Medal winner!" to grease the skids a bit. Though that's not bizzare, it is a bit crazy that for my book "project" at the end of the unit, when a lot of folks drew a scene from the book or did a short report, I came up with a board game, a mix between Monopoly and Risk, as I recall, staying up into the wee hours of the morning making cards and playing pieces. From there, I soon discovered my beloved science fiction, and that, as they say, was that. Though I've found many books that have had that effect on me through the years, and more than anything I endeavor to write books that have such similar effect, I'll always remember Carry on Mr. Bowditch as my first true literary love, that piece of literature that is likely most responsible for my current career. So I ask you, dear reader--can you pinpoint a similar book where the words on the page came alive, and turned it into a full-fledged experience for you? Do you remember where you were, how it felt to keep turning those pages, unearthing the wonderful words within? By all means, please tell us in the comments.